The first version of this review was of a single shaft, others have arrived, prompting this update. There has been some buzz about the KuroKage XT. It quickly became popular on the PGA tour. Mitsubishi’s dealers have been snapping them up as soon as the shipments arrive. The KuroKage XT is another of the Mitsubishi shafts to incorporate highly elastic Titanium Nickel wire into the tip section of the shaft. The wire, shown here, is embedded into the prepreg and rolled into the tips section much like any other flag of prepreg would be. 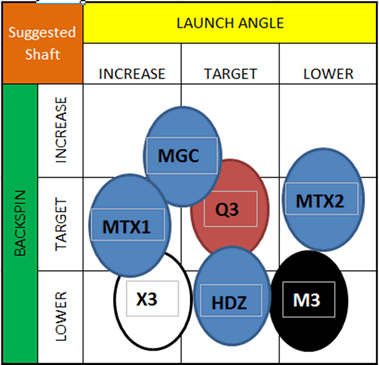 In looking for a profile match, only Mitsubishi shafts were close. An interesting phenomena I never see. It hovers around the Diamana ‘ahina and the first generation Diamana white. The third generation Diamana White has moved on to a different design, which departs from the original profile. I see a variation on the ‘ahina. The flavor is there, the rough edges softened a bit, but if you were a fan of the original Diamana White Board or the second generation ‘ahina, you are going to like the KuroKage XT. The brittle hardness of the Diamana White and the ‘ahina have been softened by increasing the torque of the shafts. Yes, you heard that right, the overall GJ torque profile has been progressively increasing from the White to the ‘ahina and now to the KuroKage XT. This video was shot at the 2015 PGA merchandise show. Meet Tsutomu Ibuki, the genius behind the Mitsubishi golf shafts. As we talk about this shaft late in the interview the feel of KuroKage XT design is discussed. This entry was posted in 2015 Models, Driver Shafts, Mitsubishi Chemical, Russ Ryden - Fit2Score on March 30, 2015 by Russ.